Good news...there is one among us who has a wonderful packing list that can be copied and pasted or printed so we'll all have a check list. That one is SewCalGal! Click HERE for the link. If you find the list helpful be sure to leave a comment thanking SewCalGal and if there is something you think would be valuable to include on the list you can also let her know. Still packing ...but I do have a review to post about later today...so stay tuned. I typically throw my clothes into a suitcase like the one above....and then pack every last thing I think I might need and typically several things I think others just might need too. Yes...I'm nuts...but we already knew that! How do you pack? Are you a planner and think packing in advance is part of the fun of going to retreat or do you hate packing like I do? The main project I want to work on is my Hugs and Kisses Quilt that I started last year. It is a quilt I am making for myself (can you believe I'm actually making something for myself? That's only happened one other time...yikes!) I love Julie Herman's pattern, Hugs and Kisses and I'm looking forward to getting back to that project. You can see I have lots of squares finished but I need to finish them and then decide on how to put them together. I'm wondering what everyone else packs when going to a 3 day retreat. Of course I'll take my sewing machine in my Tutto Large Machine On Wheels bag...I love that bag for travel....but I also have the Omni Glide in Red and what I love about that case is it rolls either sideways or forward and it can go in a circle....that bag really rocks too. I am very blessed to have two bags...I use one for my machine and the other for all my supplies and notions. I'll need a design wall of some sort....do you pack a portable design wall when you go to retreat with a large project like this? Any tips or ideas on how to minimize what I'm taking even though I still need to visually lay out every one of my blocks? I'll take my Scrap-Ma-Bob so I don't run the risk of spilling my water or drink on or near my work or anyone else's for that matter. Under my pattern you can see I have my Omni Grid Cutting Mat and Ironing area....I love this for retreats....does anyone else have one and use it? It keeps me from hopping up and down or moving between the cutting area and the pressing area. When I get to retreat I just want to make progress on my project and not spend all my time waiting for an iron etc. Of course my Beam N Read will go with me....that's a given. I think I'm beginning to see why I hate packing.....I'm afraid I'll forget things. This time I think I might get compulsive and make a retreat packing list. Have you ever done that...or am I nuts for even thinking about making one. There is a tab on the IHAN website that says Retreat Necessities.....but it doesn't have a quick tips list for packing. I need one of those things! If you have made one, would you be willing to share it with me? I'm curious how other Quilters and Stitchers move about with their supplies and projects. 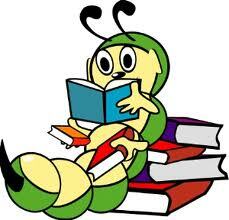 You may be seeing this sign on my blog on Thursday until Monday....because I'll be off "Fishing" LOL. All orders received on the I Have A Notion website through tomorrow will be processed and shipped on Wednesday. All other orders will resume shipping on Tuesday, February 7th. I'm not sure if I'll get reception so my blog posts might have to wait until I return ....we'll see. Just know I'll be happy as a clam and stitching up a storm! Winter brings out the book worm in me....and since my computer has been so ill (Geek Squad has had it for over a week now...hence my absence) I have brightened my days by reading the stack of books I got in Houston at Fall Quilt Market. While I know I'm 100% responsible for myself 100% of the time....I don't understand why on earth this book as not been put on my blog sooner. "Pat....why didn't you kick me hard?" 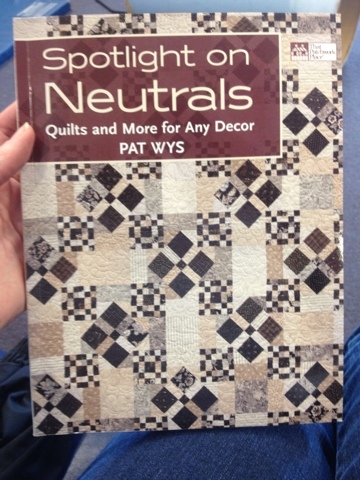 With a new book about neutrals out, one might think Pat's booth is a bit....well...lets just say...not neutral! :) Once you know a little more about Pat Wys you'll completely understand. "I love quilting, quilts, and most of all quilters. Big shock! I love every single color, including all the shades, tings, and hues within the color spectrum. I love prints large and small, from vintage to whimsical. My taste in color and fabric changes regularly. Many thanks to the fabulous fabric industry for keeping it coming! I guess you can say I'm all over the board; I don't specialize in any one area or genre, and I don't have too much trouble stepping outside the box." Excerpt from Spotlight on Neutrals posted with permission of the author. These quilts here are both in Pat's book and oddly enough....they are both my favorites from the book too. Before I move into my book review, I thought I share one more pix from Pat's Quilt Market Booth. One of the best things about going to Market is being able to spend face time with folks that I otherwise just exchange e-mails with....face to face is soooo much nicer!! Knowing that Pat loves all colors and hues I was surprised to see a book about neutrals. Neutrals are definitely not my favorite and I don't know why....honestly. After reading Spotlight on Neutrals I honestly feel differently....I have a deeper appreciation for Neutrals that I didn't have before....which is a great shift for me and my way of thinking. "Baby It's Cold Outside" is one of the quilts featured in Pat's book. There are so many different things I like about this pattern. 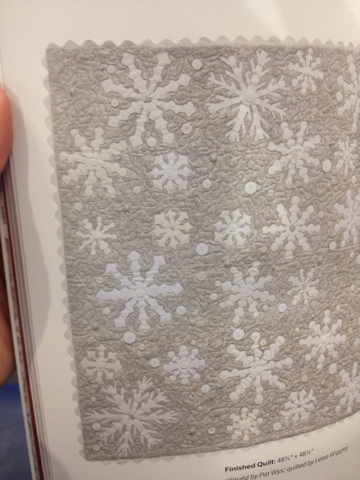 The gray fabric of the background really gives life to the snowflakes, it grounds them and speaks of quiet cold snowflakes in a way that wouldn't be communicated on a brighter fabric. Looking at this quilt calms me...centers me as I am in this winter season here in Ohio. The buttons add a lot of interest as does the wide rickrack on the border. "Scrappy Nines" is another quilt in Spotlight on Neutrals that really grabbed me. Adding the black fabrics with the neutrals makes this quilt visually interesting for me. Without the black, I don't think I'd like it very much. One of Pat's friends used this pattern to make a quilt as a wedding gift. What an excellent idea...I would have never thought of doing that. How many times do people get quilts as wedding gifts and never use them or their tastes change and the quilt no longer is used. A quilt made from neutrals is timeless....genius idea! I realize this is a photo of the back Pat's "Woven Pillow Sham" but I don't want to show a photo of everything....that would ruin the joy when you get your own copy. The reason I'm including this photo in my post is because my mother sews like this....with attention to finishing details when she makes pillow shams and other home decorator items. Pat does an excellent job with directions and explanation in "Spotlight on Neutrals"and she also included little stories that I found interesting. I think if we all followed Pat's instructions in the beginning of this book....we'd all be much better off....and I'm even including seasoned quilters in this generalization. Because I waited way to long to write this post....I'm including 5 Moda Bella Solid Neutral Fat Quarters to the giveaway! Leave a comment on this post before Thursday February 2nd telling me what peaks your interest in this book and I'll let the mean and nasty Mr. Random Number Generator choose a winner!! The LUXBAR LED Task Light I blogged about here arrived last evening. I have had a chance to assemble the light and move it around the house a bit....I'm still very impressed with the LUXBAR Light. Assembly is required but it was quite easy...just one screw and it was put together. I weighed the base and arm separately for those of you who may be interested in getting the LUXBAR Clamp Light. The arm of the LUXBAR Light weighs 11.5 oz and is approximately 19 1/4 inches long. The base of the light weighs 1 lb 11.2 oz and measures apx. 5in x 7 in. The silver knob extended out from the light is the screw that attaches the light to the base. I left it in to show you how the light just slips onto the base. I unscrewed the silver knob and pushed the light onto the base and re-screwed the knob and wah lah...it was put together. The power cord, 74 inches long, plugged into the black circle you see above the knob. No tools required!! The silver knob in this picture is how the LUXBAR can be adjusted by loosening and tightening that knob the light holds it's position snugly. No bumping or moving makes the neck droop. The LUXBAR rotates 90 degrees....basically up and down and side to side. So I bet you are wondering how bright the lights appeared in a real house right? This is a photo I took of the LUXBAR sitting on my kitchen table with the lights in the kitchen turned off. Then I brought the LUXBAR down to my sewing table. Remember, I bought the one with a base and didn't get the additional clamp (yet...but I'll be getting one). I had not really thought about using it next to my sewing machine because I have a Bendable Bright Light on my machine and it illuminates up my machine foot area wonderfully. A blogger friend, Perry, wanted to see the LUXBAR demonstrated near a sewing machine so here you go :) Above it is sitting on the base next to my current sewing machine. My old machine has a Sew Steady Table so I also got it out and held the light arm to the acrylic table. Above I'm holding it on the back of my Sew Steady Table and below it is in the front. Since the arm is so light I believe it will hold onto the Sew Steady Table and not tip the table at all when I get a clamp. You can see it does illuminate the entire sewing bed. Here is a photo of the LUXBAR sitting on top of my Sew Steady Table. If I were just doing some piecing and wanted more light this would be just fine. I certainly would not want it there for quilting or any large projects as it would be in the way on top of the table like this. This light bar is what was supposed to give me some beautiful bright light....nope...after having Mr. McSteamy install this light and throwing the box away. The only lights that can work in this light bar are not bright enough to illuminate my sewing area...and when I changed the bulbs to brighter bulbs....the light smells like something is burning. I wish I had never bought it for this purpose in the first place. The PAL is a laser that assists people in centering their ME projects in the hoop. It can also be used in beading, scrapbooking, drawing etc. You can see the laser here...it is lined up with the centering lines on this hoop. Now I know exactly where the center of my design needs to be. I took the PAL with me recently and asked some experienced ME gals what they thought of the PAL. They've been hopping for years so they didn't need any additional help in centering their designs. I think if you are new to ME hooping and want guidance the PAL does help align your design in the center. 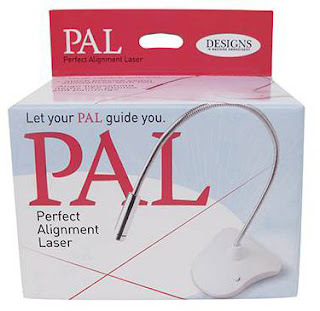 The PAL is also advertised as another method of sewing perfect seams. The light can be positioned so that the laser marks the distance you want from your foot or needle and you use the laser light as a guide. What I think the PAL is also good when you want to embroider a name or word next to a design or on a garment pocket. I would line up the laser and follow the horizontal line so the lettering would be straight and not slope down hill. If you were putting a name next to a pocket for instance....you cold align the laser with a button or the edge of a pocket to be sure it comes out straight. I hope this is all making sense....I'm certainly no expert...as you know. This is not my embroidery piece, it was given to me by a friend. If I wanted to go back and hoop the block and add her name I could be sure it would be placed correctly. I'll also embed a YouTube video here so you can see what I'm talking about. For a video on Continuous Embroidery Alignment...you can click HERE! I hope all of this information is helpful to some of you. I'm off to the post office now....I'll check on the Flamingos to see how they are doing today. If I've been told once, I've been told a thousand times...practice, practice, practice....and then practice some more and you'll improve you Free Motion Quilting skills. That's just what I did yesterday...I spent 4 hours with some friends and we all had a chance to practice and learn from Patsy Thompson. Having Patsy work with each one of us at our own pace and level was wonderful. I'm more of a beginner and my only goal is to be more comfortable and do what ever it is that I can do, without wanting my work to look a certain way. I don't aspire to become an incredible quilter....I aspire to love the process of making my quilts and have some tools under my belt to be able to do some of my own quilting. I wanted to practice some Free Motion Embroidery, Trapunto and play with a variety of weight threads....and I certainly had my chance. Before I show you my "progress," I thought you'd like to see some of Patsy's work. I like the contrast between these two pieces. Patsy used her Appli-K-Kutz die to cut the same feather for each quilt. It is the weight and choice of threads that Patsy used in the second quilt that makes it look so very different from the first. I so admire her choice of colors and how she has chosen to put these pieces together. Patsy has added Machine Embroidery to her quilting and I absolutely love this corner piece shown above. You may have already seen this table runner on Patsy's blog. In real life...it is so much more than what it looks like in photos. Look at the Machine Embroidery....I just love it added to her designs....it really grabs me. Here are a few more samples her free motion quilting. Ok, remember when I said that I just want to improve what I do? Take a little break....blink a few times...other wise you just might miss just how nice my piece really is....LOL. It may not look like much to many of you, but to me this is a sign of real progress and I had a ball stitching on the applique shapes. The other thing I loved is playing with the different variety of threads. I had first stitched the little veins on the leaves in the lime green color. Patsy suggested I use some Floriani (PF 516-the gold tone thread above) thread just inside the lime green and it would make the leaves really pop. She was absolutely right!!! (No surprise there...but it is incredible to see before your very eyes). I'm not finished with my flower yet. Patsy suggested I use Invisifil Thread to go around my flower after I had done the thread embroidery and then do some quilting. When Patsy says that many quilters under utilize their thread...that is so true of me. I'm going to continue my Free Motion Quilting practice and use lots of the variety's of threads I own. The stitching in red in the upper right corner....that's my very first time ever doing any Free Motion Quilting....so as you can see....I've come a long way!!! SewCalGal's Free Motion Quilting Challenge is going on so I'm going to have to take more pictures of my practice and submit them. I decided I was going to fiddle faddle with every single light I could find while at Quilt Market until I came across a table light I could not only use for myself, but also one that I could recommend to others with confidence. I was impressed with the engineering and mechanics of the LUX Bar LED Light after it was put through the IHAN bump, smack, push test and passed with flying colors :) I really like the LEDs too...it is really bright. The light area is 36 inches...I took their word for it...I didn't measure it! The arm is 19 inches the head swivels 90 degrees. The LUX Bar Light is advertised to have 50,000 hours of light.....1 year = 8765.81277 hours so you do the math (I'm not going to calculate the years....let's just say it's a very, very, very long time ay? I gave the LUX Bar Clamp Light that was attached to their booth a few good bangs too, just to see if it would droop and it didn't. The next day I checked back and and it was still in the same position, ummmm Very Good! The clamp opens 2 1/2 inches and has pads where it comes into contact with the table, both on the round part and where it meet the top of your table. No scratching the table on either side...that's very nice too. The other lights I thought were nice are the Luxdome Task Lights and you can see them on the right above. They would be nice for a desk or computer area but I was mainly interested in a table light for my sewing area. I have something else that is Mighty Bright to share with you too. It's the Mighty Bright Microclip Lights. I've had a Microclip light for a few years and I keep it clipped to my bussom pad pin cushion. I love this little light and I always forget to tell people about it. It's really not such a strange place to keep it at all....you wanna know why? Because it is within reach when I need to check for threads hung up in my bobbin case. Ever try to see up in there? Not so easy is it? See....it doesn't shine all over and into people's faces...oh I'm so thoughtful...LOL. Another very cool thing is the little light swivels...I'm not kidding! See the little acrylic head, you can adjust the position. Handy little fellas they are! When you get to mid-life or past...you start to appreciate the finer things in life...like good shoes, a good bed and some decent light!! !